In 2017, PostgreSQL became the fastest growing database in the world, and time-series continued its reign as the fastest growing database category (source: DB-Engines). So it makes sense that 2017 would also be the year that someone launched a time-series database built on top of PostgreSQL: TimescaleDB. 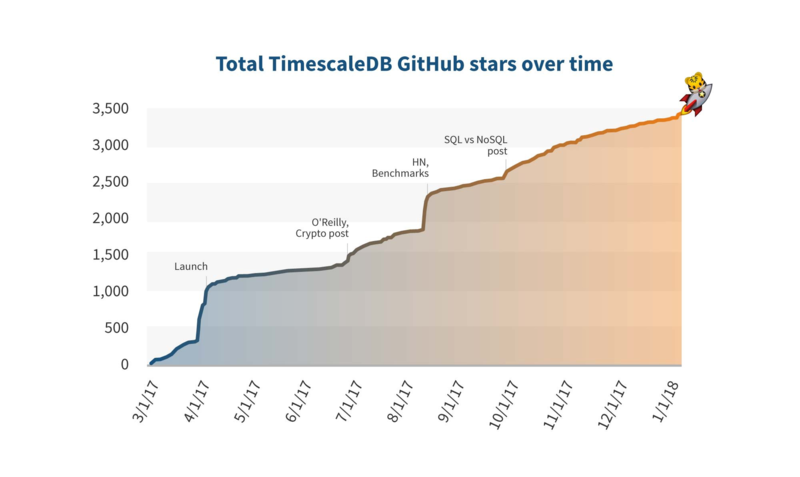 We officially launched TimescaleDB on April 4th, 2017, and were pleasantly surprised by all the positive feedback (special shout out to the PostgreSQL community!). And then, just months after our launch, we found that users were already deploying TimescaleDB successfully into production environments and planning new applications around the database. Now, nine months later, businesses worldwide already trust TimescaleDB for mission-critical applications from industries as varied as manufacturing, finance, utilities, telecom, mining, ad tech, oil & gas, and the smart home. Applications built on TimescaleDB include complex monitoring systems, industrial machine data analysis, geospatial asset tracking, operational data warehousing, and financial risk management. From 0 to over 3,400 stars in less than a year. Thank you everyone! April 4th, 2017: The TimescaleDB initial launch (“When Boring is Awesome: Building a scalable time-series database on PostgreSQL”), soon followed by a technical deep-dive (“Time-series data: Why (and how) to use a relational database instead of NoSQL”). August 10th, 2017: One of our engineers, Rob, publishes our first benchmarks (“TimescaleDB vs. Postgres for time-series: 20x higher inserts, 2000x faster deletes, 1.2x-14,000x faster queries”), and our website again ends up at the top of Hacker News. September 25th, 2017: Our CEO Ajay pens a think piece based on general trends we keep seeing: “Why SQL is beating NoSQL, and what this means for the future of data”, which is viewed over 200,000 times and translated into Russian and Chinese versions. But that was the past, and now our focus is on 2018. There’s already a lot in the pipeline that we can’t wait to share with you. Stay tuned! Until then, whether you’ve been steadily following our progress or are just learning of Timescale, be sure to download TimescaleDB and join us in Slack. Interested in one of these positions? Please reach out at jobs@timescale.com. Other questions, feedback, comments? Please email us at hello@timescale.com.